Drinking Bottles That You Design on Line. Ready in 1-2 Business Days. Branded Drinking Bottles. How Many Times Will This Be Seen? 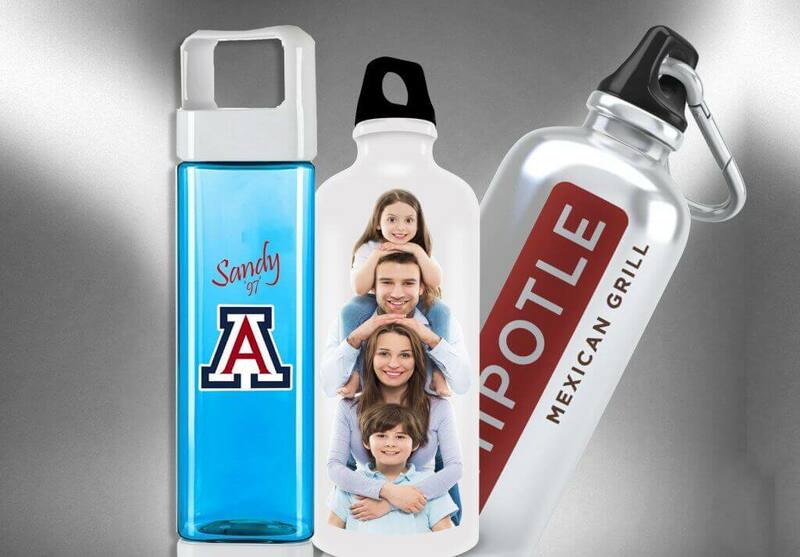 Graphic Impact produces branded drinking bottles, in full color, and without a requirement for any minimum purchase. No minimum purchase and no set-up! A drinking bottle is always visible, in your hand, on a table, or just waiting to be filled. This is an excellent opportunity to show off the brand of your company or organization. How About a Special Gift? Having problems with selecting the right gift. We print on almost all cylindrical objects. That includes drinking bottles, wine bottles, champagne bottles and a lot more. Birthdays, weddings, holidays and just a special thank you. Graphic Impact carries a variety of bottles for digital printing. One of our favorites is the CLEAN BOTTLE. The Tritan Square is the patented square Clean Bottle. Retaining the iconic square shape, the new Tritan Square features a removable bottom for easy cleaning. The Square shape prevents rolling if dropped and still fits most cupholders. This stylish bottle comes in 3 different colors and is custom printed by Graphic Impact. 25oz, Dishwasher-safe, BPA-free. Interested in designing your own on-line? Just CLICK HERE.